Limited red vinyl. Packaged with a digital download card of the entire LP. This collection of SOVIET FUNK was all recorded by Pavel Sysoyev in Abakan, the capital city of Khakassia between 1971 and 1976. Sysoyev was an employee of the USSR State Committee for Television and Radio Broadcast (state controlled media). He ran a recording studio intended to create content solely for the government media entity. However, Sysoyev frequently brought in his friends and run late night recording sessions when no one else was around. Sysoyev acquired a small collection of U.S. R&B and Jazz albums in 1968 from a friend, but that was about it for him and his friends. Yet somehow, this small group of classically trained musicians was able to forge a funky sound of their own. Rooted much deeper in the jazz quartet tradition than the R&B styling of James Brown and The Meters, they tapped into a way of playing jazz with a relentless groove that we endearingly refer to as funk. Listen closely and from time to time you will find elements of Russian classical music in the precision execution of oddly metered unison parts, complex poly-rhythms, and the use of time signatures other than 4/4 (so commonly found in most American funk). 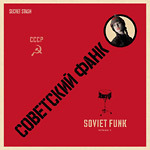 Soviet Funk Vol I is just a small sampling of the vast catalog of recordings produced by Pavel Sysoyev and his friends.